Even though we’re getting slammed with zucchini, the Tromboncini squash are also starting to come in. Tromboncini are uncommon, but I’m not sure why. They’re very productive, at least in terms of pounds of food produced (though most of the squash tend to be large, so you don’t necessarily have large numbers of them). They are easy to use – they have a long neck that is entirely seedless, then a bulb on the end that contains all of the seeds, and a skin that’s only slightly thicker than zucchini, so most recipes don’t need peeling. They are versatile – they can function both as a summer squash and as a winter squash (though they don’t store quite as long as, say, a butternut). 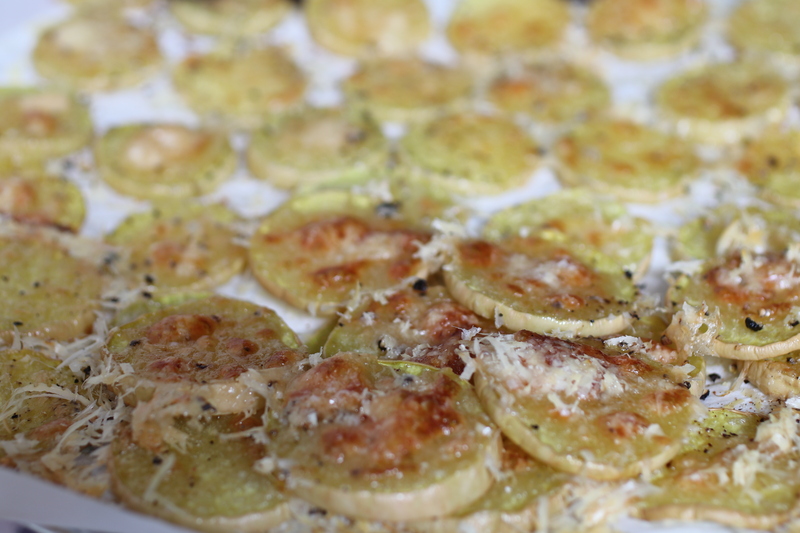 And they are very tasty, with a flavor somewhere between a zucchini and an acorn squash. Anyway, we have converted a few true believers at market. Most people are afraid to try them, but those who do usually come back for more. But, due either to the massive pile of zucchini on our table, or too few brave culinarians, we had a few left after this week’s markets. So, yesterday was a day to be creative with Tromboncini. That said, you could make this recipe using zucchini, too. Just sayin’. These are yummy snack or hors d’oeuvre bites, very simple and quick to make. You get a crispy browned parmesan crust on a tender squash round, both a flavor and texture bonus. And they just smell durn good when baking! Barely counts as a recipe, it's so easy. Yet these yummy hors d'oeuvres or snacks are incredibly flavorful with an aroma that should sell more houses than cookies do! 1 Tromboncino Squash large. Or you could do a couple of small tromboncini. Preheat oven to 450 degrees, and line a baking sheet or two with parchment paper. Wash the tromboncini, but don't peel. Slice across the neck into rounds about 1/4" thick. Try to be consistent in your thickness (if you have a good mandolin - I only have a cheap one that won't work for this - it might be a good time to break it out). Spread the slices on the baking sheet(s) in a single layer. Touching is OK, they'll shrink a bit when baking, but don't overlap. Sprinkle the slices with salt, freshly ground pepper, and garlic powder to taste. Then top each with a sprinkle of parmesan cheese. Bake for approximately 15 minutes. Check periodically, as the thickness of your slices will impact baking time quite a bit. Remove when the cheese is crusty and golden, and the squash is soft and tender. Serve hot. You could also use zucchini, or a combination of zucchini and tromboncini, or some other summer squash. But the seedless, coreless nature of the tromboncini really shines here.